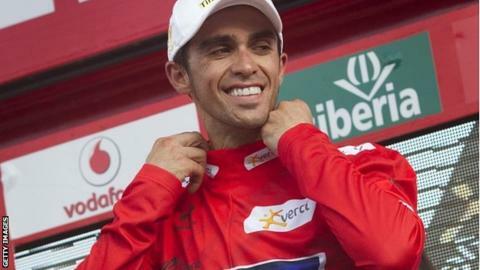 Alberto Contador retained the Vuelta a Espana overall lead before Saturday's decisive stage but saw fellow Spaniard Alejandro Valverde cut his advantage. Belgian Philippe Gilbert took his second stage win of this year's race but Valverde finished second to earn a time bonus of 15 seconds. Contador, who finished two seconds behind Valverde, leads by one minute 35 seconds ahead of the penultimate stage. The 29-year-old is riding his first Grand Tour since returning from a ban. He is hoping to secure his second Vuelta title when the three-week race concludes in Madrid on Sunday. Great Britain's Chris Froome, the Tour de France runner-up and Olympic time trial bronze medallist, remains fourth, 9:48 down on Contador. BMC rider Gilbert, who also won the ninth stage in Barcelona, accelerated at the head of a pack of some 40 riders with 500m to go of the 178km flat stage from Penafiel to La Lastrilla to win again. 1. Philippe Gilbert (Bel/BMC) 4:56:25"
2. Alejandro Valverde (Spa/Movistar) +1"
3. Daniel Moreno (Spa/Katusha) +1"
4. Joaquim Rodriguez (Spa/Katusha) +1"
5. Gianni Meersman (Bel/Lotto) +3"
6. Bauke Mollema (Ned/Rabobank) +3"
7. Jan Bakelants (Bel/RadioShack) +3"
8. Ben Swift (GB/Team Sky) +3"
9. Rinaldo Nocentini (Ita/AG2R) +3"
10. Sergio Henao (Col/Team Sky) +3"
11. Alberto Contador(Spa/Saxo Bank) +3"
1. Alberto Contador (Spa/Saxo Bank) 77:21:49"
2. Alejandro Valverde (Spa/Movistar) +1:35"
3. Joaquim Rodriguez (Spa/Katusha) +2:21"
4. Chris Froome (GB/Team Sky) +9:48"
6. Robert Gesink (Ned/Rabobank) +12:00"
7. Laurens ten Dam (Ned/Rabobank) +12:58"
8. Andrew Talansky (US/Garmin) +13:09"
9. Igor Anton (Spa/Euskaltel) +13:52"
10. Benat Intxausti (Spa/Movistar) +15:13"